This plastic water bottle is the perfect travel companion for work, the gym or just out and about. 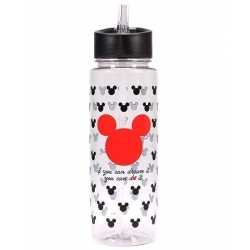 It features a repeat print of tiny black Mickey heads all over. 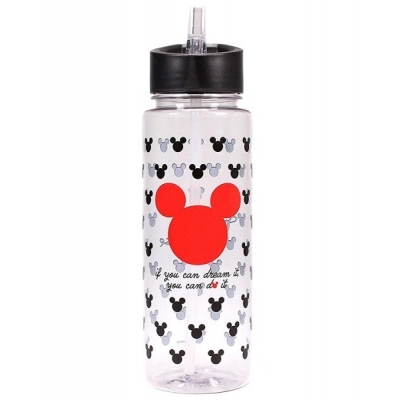 The front has a large contrasting red Mickey head with the words "If You Can Dream It, You Can Do It" in black with a tiny red Mickey head as the "o", while the back shows the words "Mickey Mouse". 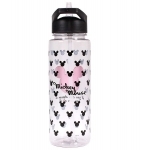 With a flip straw for easy drinking, this water bottle is perfect for gym-goers or a motivational accessory for those who want to reach their fitness goals. Words on bottle read "If You Can Dream It, You Can Do It"